Next week, the South African wine industry is hosting the international wine trade consisting of wine buyers and media at Cape Wine 2015. We are of course also participating in the programme and will be supporting the industry initiative by hosting media and trade. I was however reflecting on Wine Fairs as a whole. What are we expecting to gain from them and what are the actual results? I have been attending wine fairs and shows across the world for many years and it is interesting to see how the format is changing and also to see how some shows have gone from strength to strength while others have not. Seminars and workshops have been added to address industry issues, concerns or trends and themed tastings serve as a guide within the magnitude of options. Vinexpo (Bordeaux): Its latest edition earlier this year reported 2 350 exhibitors from 42 countries and 48 500 visitors from 151 nations. 36% of visitors were from outside of France. 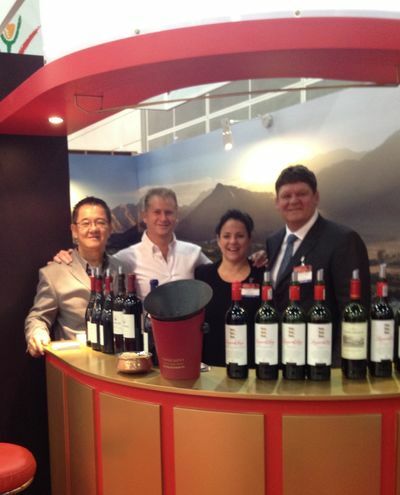 Vinexpo Hong Kong: Vinexpo Hong Kong is a very important trade show to reach the Asia-Pacific region. Rotating bi-annually with its Bordeaux counterpart, the next edition is in 2016. London Wine Trade Fair: According to the website 11 247 visitors attended with 750 exhibitions showing their wines. Looking at these figures, it seems that wine trade fairs are still doing well. But what are the actual results for both exhibitors and visitors? This is of course something that is very difficult to measure. Only so many deals are signed on the spot and often it is a contact made at one show, that results in business a few years down the line, or not… Often these events are also used to meet with existing customers, showcase new vintages and cement existing relationships. And perhaps it is this difficulty in measuring direct results and also the serious competition in the industry, that makes one go back year after year. Can one afford not to go? While I do see the value in these events, I am questioning the format. In today’s day and age, are we not ready for something less expensive and more effective? Having said that though, I am unfortunately not suggesting that I have a workable alternative! I am also not suggesting we cull these fairs as a whole. Don’t get me wrong, we will not miss ProWein, and Vinexpo Hong Kong is of exceptional value to us, especially as in the case of Asia, the market is still new, the demand high and the interest exceptional. But perhaps with the technology of today, there are ways to connect and become visible that will make measuring results easier and that will be much more affordable. I am also not trying to be negative a few days before Cape Wine 2015. I know that the fair serves as an important tool to showcase South African wine and the exceptional improvement in quality over the last decade. More than that it also introduces the South African culture, hospitality and beautiful environment – all things that we hope will improve our image as a wine producer as well as tourism destination. Earlier this year in my blog Wine Fairs – not only for the show, I shared a few suggestions on how to make the most of your participation in a wine fair. Let’s open our minds to alternatives, but in the meantime, ensure we get the most of this valuable opportunity.